I went to Florida last week for a modern family vacation. We used to always take family trips the week after Easter. My parents didn't mind taking us out of school to avoid the crowds. It worked then and it worked now. However a lot has changed over the years. Taking a family vacation is not as easy as I remember. I remember getting new clothes, packing them up for the trip, waking up early, taking a smooth ride, and stopping every now and then to eat delicious, not at all nutritious, home cooked food. In actuality, I had to work almost right up until my flight. I needed to save my paid vacation days. On Tuesday, I worked, went to the gym, went to Muay Thai, showered, packed, cleaned, and went to the airport. I was so exhausted by the time I got to my seat, I don't even remember taking off. I had to change flights in Houston around 5:30am Central. I had a 90 minute layover and between naps, I waited for the sun to rise, so I could take a picture. It never showed. We boarded and again I slept from take off to touchdown. Florida was hot and humid. I'm guessing the humidity was actually quite low, because I barely noticed it. And my tolerance of moisture has been greatly diminished. Florida was also green. There were trees and grass in every direction. There were clouds and a refreshing wind. If I sound like I was desperate to be on the East Coast, it's because I apparently was. I have two brothers, one actually is from another mother. His name is Ty'yier and he's turning 8 this month. My dad always takes him on a trip for his birthday. This year they went to Universal Studios (which they have frequented in years past) and I went to Florida to meet them. I haven't seen Ty in years. He was born while I was in college, and right after graduation, I moved to Fargo. He came to Fargo once (first words there were "Danie I'm cold.") and I saw him occasionally when I visited my dad. But our relationship is lacking. We enjoy each other, we just don't spend as much time together as we should. My dad and Ty picked me up at the airport. 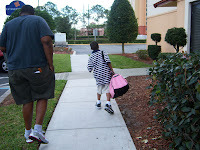 My dad took my bigger bag from me, and Ty offered to take it from him. Yes it was too big for him, but he wanted to carry it. So he carried it. I told him to tell me if he needed help. Five seconds later, he needed help. I took the bag from him, and my dad went to take it from me. Ty said "No dad, let her carry her own bag." Maybe chivalry comes at age 9. Anyway we were already at the car.